A lot of social networking sites are available on the internet which helps you in staying connected with your friends and family members. Not only you can use social media websites to connect and chat with your friends but also get the latest updates about what is happening across the globe. If you ever wanted to create your own social network site like Facebook, you can fulfill your dream. There are some very suitable tools which you can use to create your own social network or stylish social networking sites with all standard features. 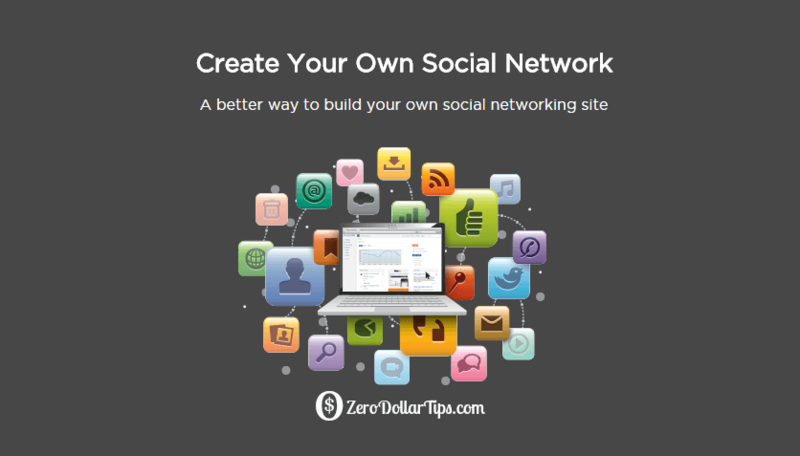 In today’s free software guide, I am going to share a complete list of top 10 best tools to create your own social network like Facebook. The first tool which you can use to create the open source social network is Ning. Ning is one of the best platforms which you can use to create a fully functional and appealing social network website starting from scratch. You can build your social network for free of cost using the standard package. You will get all the basic features in the standard package of Ning. The next tool to create your own social networking site like Facebook is CollectiveX. Using CollectiveX as a tool for creating a social media you can start a great platform where people will be able to share anything they want to share within a controlled environment. Some of the main attractions of CollectiveX are the forum, calendar, and a file area. You can use the file area for uploading photos which you want to share with anyone. If you are looking for a hybrid tool for creation of a social networking website you need to use ONESite. Users will be able to mask the social network URL’s which will help in easy meshing with the external websites which are out there. PeopleAggregator is also one of the most helpful social networking website development tools which will help you to build your own social network. The tool uses Open ID authentication method which supports the open identity schemes which are out there. You can also use the API which will help you in importing and exporting data. You can also use KickApps if you want to create your very own open source social network. KickApps is ideal for the developers who want to add more features to their existing social media platforms. Using KickApps, the hassle of coding is finished and all the features are maintained by the KickApps. Crowdvine is also a well known free open source social network software. Crowdvine provides the simplest solution which one needs to create your own social networking site. Some of the main attractions of Crowdvine are profiles of members, the blog posts and one of the best features which are offered by this website is the public messaging system. If you want to create your own social networking website you can use GoingOn. Don’t go with the looks of this tool as they are not pretty but the features which are offered by GoingOn are pretty amazing. All the features which you won’t be getting in KickApps and Ning are available in GoingOn. The company has partnered with many existing social media websites so that they can integrate different social networking websites onto existing ones available. If you want to build your own social network in the least number of steps you should use Me.com. The tool works a lot like MySpace. One thing which we don’t like about Me.com are the themes which are offered by this tool. There are a lot of features which are provided by Me.com, but many are not executed properly which result in a bad interface. Let’s say you want to upload a video or audio on your account. To do the same, you have to record the video or audio using the webcam as there is no option to upload any file. You can consider Haystack as a stripped version of Crowdvine. The social media websites which are created with the help of Haystack are simple. The users will be able to maintain their social media websites easy thanks to the easy functionality. The last tool which will help in social networking website development is Snappville. The tool is based on SNAPP, a platform which helps in the easy creation of social media websites. There are a lot of amazing features offered by Snappville like chat groups, messaging, calendar and much more. So, these are the 10 best tools to create your own social network like Facebook. We hope, now you are able to build your own social media website using these free social networking sites builder. Also, please feel free to share your view with us through comments – which free social networking sites development tools are you planning to use for creating your own social network like Facebook? which is the best from this ten how do i start i want to start a social networking to help others and want to save sea animals, please help and suggest me. Welcome to zerodollartips.com. We are happy to know that you liked this list of top 10 tools to create your own social networking site and now willing to know about the best social networking sites development tool from them. We would suggest you to try out Ning, CollectiveX, or ONESite free open source social network software in order to start your own social networking website. This is a very good and helpful, article thanx Amit for share this idea bcs i am confused after some time but now i am happy. Thank you very much but i will like to join you.